Business Rules are a way in which you can specify automated events to take place depending on the status of information. For example kiosks might be considered to require attention if they haven’t reported any usage for a specified period of time (e.g. 2hrs). Severity Levels allow for the setting of degrees of severity. For example if a bill acceptor can hold 250 notes before its full and unusable on a journey from empty to 250 notes. At 125 notes it is 50% full which may be the threshold set before it requires emptying. 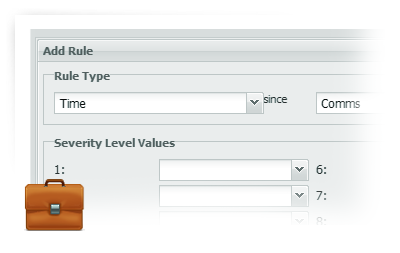 Using severity levels to specify what happens at these various levels creates a simple and maintainable escalation process which can be applied to an entire network. Finally notifications are the outputs that people receive such as an email with a summary, or a text sent to an in-field engineer requesting urgent action. We invite you to take a look at what we have created and to provide feedback on how this could be improved on or integrated in different ways..